Who Wants to get “Down”? A Gear Clinic is the day that everyone shows up to work in the outdoors world. Why? Well that is simple, because we are gear junkies. A gear clinic means two things to a gear junkie: First, we are about to be exposed to the newest and best information in that particular product category. Second, we are going to be offered a sick crazy deal on the clinic of the day. A sales representative comes in the store and spends anywhere from 1-3 hours reviewing everything about the products, and in this case it would be down. RRT has had clinics over down sleeping bags, jackets, and down treatments. Like most anything, not all down is created equal. Down, which is typically a byproduct of the meat industry, can be either goose or duck. We’ll discuss the difference between goose or duck, the fill power of down, the contents of down fill, down maturity, and what’s new in down technology. Think of the feathers around the exterior of a goose, these are tough with large stems. A goose or duck will actually derive its warmth from what is under them, the down feathers or down plumes. Down plumes are the lightest insulation available. The more loft, the greater the barrier between you and the harsh cold. Loft is going to be dependent on both fill power and how many grams of that fill power are being used? “Fill Power” is the number of cubic inches that are displaced with a single ounce of down. So if we use 700 fill down, it will displace 700 cubic inches of space with just one ounce! That is why the outdoor world loves it! When you compare the additional weight that you can save with higher fill power, it can really add up. It’s best to look at the fill power and the grams of down used. 100 grams of 700 fill will be warmer than 75 grams of 700 fill. Also, equal grams in a 500 fill jacket will not be as warm as that in a 700 fill jacket. If information is not available on grams or fill power, it’s likely to be of poor quality. In the outdoor industry, most down products will be 500-900 fill. A typical down sweater may be 650 fill and 100+ grams. The Rab Microlight is 750 fill and 140 grams of fill. The Montane Nitro is 800 fill and 150 grams of fill. A competitors down sweater at the same price uses a 600 fill and a unspecified weight (But it does have a more trendy name sewn on the front). About a year ago, the adventurous crew at RRT finally fell in love with what we feel to be the best sleeping bags on the market. There are a slew of factors that make Sea to Summit sleeping bags so awesome, but our favorite part is how they test each batch of down product. This is the IDFL test report. The test details the percentage of down clusters, fibers, feathers, and other impurities. This report also verifies the ratings of fill power promised to the consumer. Most times, the test brings back over qualified ratings! Hopefully, most consumers like me are done buying cheap, unaccountable, and short-lived pieces of gear. You can understand how awesome that each Sea to Summit sleeping bag comes with its own report. With the cost of goose down on the rise, you can find many companies switching to duck which has been thought of as lower quality down. While goose has its benefits, duck down is not much different. Duck down has more natural oils adding extra weight. The oils also can cause the down to have a slight odor when wet. Another great aspect of going with a creditable down supplier and manufacturer is knowing the maturity of the down. 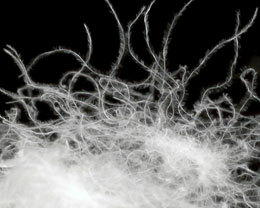 Each fiber of the down cluster has hundreds of smaller fibers on it, and beyond that even tinier fibers on those fibers. A mature goose or duck plume will develop more and more of those tiny offshoots which act as tiny hooks that keep the down fibers from separating and creating cold spots. Basically, the more mature the bird, the less chance of cold spots through the down. When you apply this knowledge to sleeping bags, lower quality, less mature down will not cling to itself as well as more mature down. The down fill will separate sooner and you will be left with a cold spot in its absence. A cold spot in a sleeping bag that is meant to keep you safe and warm is unacceptable. Mature down will be more dependable and will also have a greater life span. Where modern technology is taking us. The buzz is out and everyone is wondering if the technology is ready and real. Through a few innovative processes, down can be treated to become hydrophobic. Down has notoriously been the perfect solution for insulation except for when it comes to a cold kid in a wet down bag. Down naturally becomes very matted down and loses its loft (the only thing that matters) when it is wet. Enter Down Tek. Down-Tek, besides being a Cincinnati company is also the most environmentally friendly of all down treatment providers. Down Tek treats down to become anti-microbial, anti-bacterial, and biggest of all water repellent. Its water repellency is best described as the “Lotus Effect” where water molecules do not adhere to the down feathers. The treatment doesn’t add any weight to the bag either. I’ve attached a picture for a fun look at this effect, or you can visit Down-Tek for a demo video. Despite being sloshed around in a jar of water the down retains its loft after being strained out which is truly amazing. There is a lot more detail to this as you could imagine, and the truth is, you should take care of your bag and keep it dry anyway with or with-out dry down. Currently both Sea to Summit and Big Agnes are using down from Down-Tek. This spring unveils all of their respective sleeping bag lines utilizing this technology. Today in-store we have the Talus from Sea to Summit showcasing the Down-Tek. The Talus3 is 700 grams of 750+ fill power goose down, guaranteed to be 90% or higher in full down clusters only. The Talus uses only mature down fibers and has an EN rating of 16/1/-35 degrees. Now you know what all that means and about the wonderful world of down. Come by the store and speak with a clinic specialist and as always, a product user.